A portable air conditioner is fairly easy to install. As long as you have all the components, you can do it yourself in 10-30 minutes. This guide is a step by step overview of how to install a portable AC in your room, along with frequently asked questions. The most important aspects of installing a portable AC properly are venting and drainage. Venting properly exhausts the hot air removed from your room to outside, where it dissipates naturally. 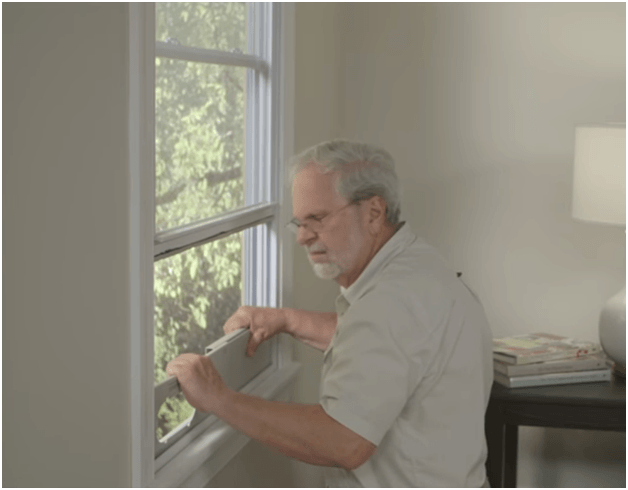 In this guide, we’ll show you how to vent through the window and explain your alternatives when window venting is not possible. Drainage is the other critical thing to get right. In this guide, we explain how to drain evaporative ACs and manual drain ACs properly. 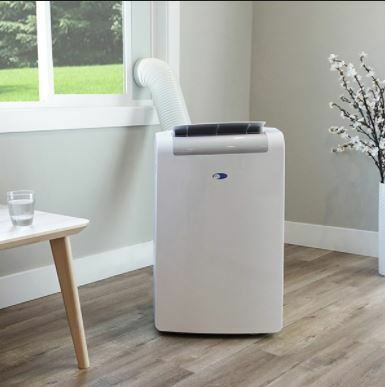 If you are still searching for a good portable AC, make sure you check out our buying guide which reviews the latest top-rated portable air conditioners. Before you start setting up a portable AC here are some essential safety tips to keep in mind. Read the manual before starting. This guide is not a substitute for your product manual. Always refer to the manufacturer’s installation and usage instructions first. Portable Air Conditioners are heavy. Take Care! Do not attempt to lift one by yourself as it could cause serious injury. If you are moving it on a flat floor, check whether it has caster wheels. In that case, you just need to push it gently. Never connect a portable AC to a power extension or a power strip. 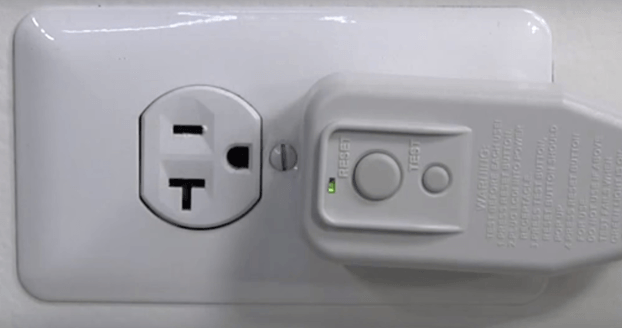 Connect it to a grounded electrical outlet only. They should not play around it, hang or sit on it. It could tip and get damaged or cause serious injury. Only plug it in after you have completed installation. Especially your exhaust and drain hoses - make sure the are air- and water-tight, and that all sealants have cured. Make sure the included air filter is installed before using a portable AC. Flying debris can damage the unit. Clean them regularly and replace them as directed by the manufacturer. Do not attempt to repair a portable AC yourself. Take it to an HVAC technician or ask the manufacturer for guidance. A portalbe AC should be placed on a hard level floor at least 8-12" away from obstructions like furniture and flowers. Check the manual for the minimum clearance space from the wall. Ideally, a portable air conditioner should be placed near an outside window and near an electrical outlet. Check that the power cable can reach the outlet without stretching it too far. Also, check that the vent hose can reach the window without over stretching it. Most manufacturers advise that you keep the hose as short and straight as possible. When your AC is positioned at the right place, then you are ready to start the installation. Check all the components in the box against the list in the manual. Make sure that everything is included. Some kits may also include screws and weather strips or foam. If anything is missing, contact the retailer immediately. 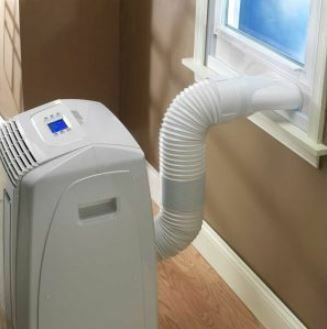 The typical way to vent a portable air conditioning's hot air exhaust is through a window, to the outside. If you have no external window in your room or you can’t use a window (perhaps because it is a casement window), then read the next section. Window venting is actually fairly easy with the right kit. Just make sure you have all the components necessary. Window kits are designed to work with most kinds of windows including those that slide to the side and those that slide up and down. If your window has a traditional up-down operation, then place the kit at the bottom and extend it until it fills the width of the window opening. If your window slides side-to-side, then place the kit on one side and extend it until it fills the height of the window. If your window opening is smaller than the minimum length of the slider kit, you’ll have to trim the kit down. If your window opening is larger than the maximum length of the slider kit, then you can use plywood, Plexiglas or cardboard to fill the gap. You can also buy the filler material at local hardware or home improvement store and have it cut to the precise dimensions you need. After you fit the window kit properly (no air should leak / no sunlight visible), then close the window to hold the slider kit in place. Some kits also come with weather strips or foam to put between the slider and the window to prevent insects and warm air from getting in. Your kit may also have screws that you need to use to hold the kit more securely in place. If you want, you can buy a separate security lock to make sure the window cannot be opened from the outside. First, attach the vent hose to the back of the AC. Check whether there is a connector already in place on the AC. If there isn’t one, then install the connector first and then attach the hose. At the other end of the hose, connect the window exhaust connector, which is usually a part of the window vent kit. Extend the hose until you connect the connector to the slider kit. Make sure it securely locks into place. You'll want your exhaust hose as linear and direct (short) between the unit and the window as possible to avoid restricting air flow, which can damage the unit or prevent it from cooling as well as it can. Some manufacturers also recommend extending the hose no more than 9 feet. The shorter and straighter the exhaust hose, the better. Now it’s time to plug in your portable air conditioner. As we mentioned in the safety tips, only use a properly grounded outlet and never connect the AC to a power strip or an extension cord. Press the ‘TEST’ button. This activates the built-in safety feature that cuts off current in case it detects something wrong with the power flow. The indicator light and unit should turn off. Then press the RESET button to reconnect the AC. Note: Do not use these buttons to turn your AC on or off. They are meant only for periodic testing and to turn the AC on in case power is cut off. 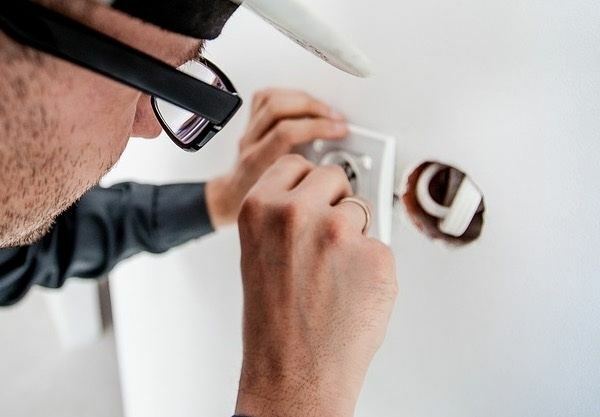 Refer to your manual for exact instructions on how to properly connect the AC to an electrical outlet. When your AC comes on after you press RESET, it’s ready to use. Check your manual for instructions on how to set temperature and humidity levels. Most units come with remote control. Window exhaust venting is easy and convenient. But this doesn’t mean you cannot enjoy your AC if you have no window or cannot use the one that’s there. ​ If you don’t use your chimney, that’s another place you can install the vent hose. Just make sure there is no soot in the chimney and that the flue is open. If you cannot vent through a window, the next best place is the sliding door. The process is pretty much the same as with window venting. You can use the same window slider kit, but you’ll need a filler material to fill the gap that won’t be covered. I recommend getting a specialized slider kit for sliding doors. It will fill up the full door height. You won’t need to use any filler material. Venting through a sliding door has its challenges. Can you still open the door? What about security? Here’s a video that provides some good suggestions. If the portable AC is for an office, it may not be possible to vent through the window. A drop ceiling is a good alternative. You’ll need a special venting kit for a drop ceiling and may need the help of an HVAC technician. It’s also important to talk to the building manager in case there are any safety or air quality issues regarding drop ceiling venting. If you are in a windowless room, you can pass the vent hose through the wall. You’ll need a professional to cut the right sized hole in the wall where you can secure the vent hose. If you don’t use your chimney, that’s another place you can install the vent hose. Just make sure there is no soot in the chimney and that the flue is open. One of the most common complaints I hear from portable AC owners is leakage. When air is cooled, humidity is removed - and that means water needs to be removed over time. If you don't install a good system for doing that, it will leave a puddle of water on your floor. Most portable AC water leaks are caused by not sealing the drain hose correctly or when there is too much humidity from the room, overwhelming the drainage capacity of your unit (or drip pan). 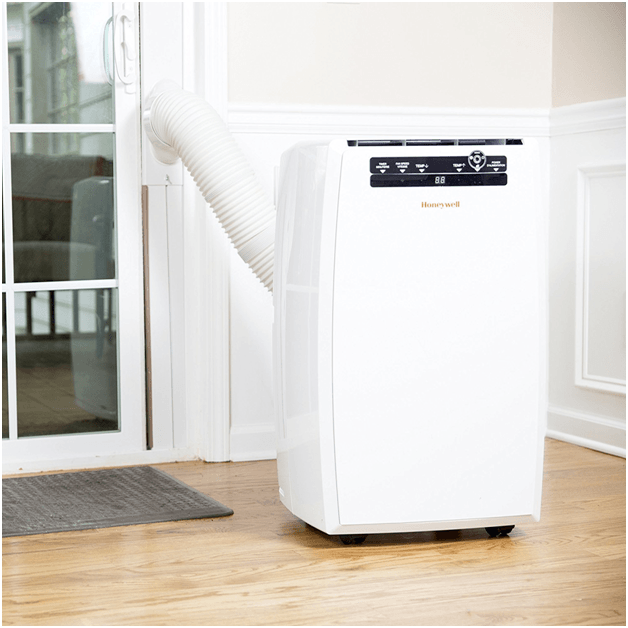 When you buy a portable AC, know whether it is self-evaporative or requires manual draining. Each uses a different system to trap and remove condensed water from your home. Self-evaporative portable ACs exhaust water outside along with warm air, through the exhaust hose. You won’t need to drain these most of the time. But sometimes, there is so much humidity in the air that the condensed water will accumulate in the AC, build up in the emergency pan and eventually leak over the top, usually near the drain plug. Some units have an indicator, usually 'FL', to tell you when the emergency drain pan is full. You are then supposed to either position the AC over a drain or connect a drain hose. Consider closing the drain plug with a cap (some units come with their cap)to prevent leakage. ​If yours has no indicator, just keep an eye on the floor under the unit. If you notice a bit of leakage, it’s time to drain it. If you have capped the drain plug, you’ll know the water collector is full when the unit stops working. You will either need to periodically empty water from the unit's drain pan manually or install a separate drain hose to send the water outside. Do all portable air conditioners need to be vented outside? In general, yes. Most do need to be vented outside - but not in all situations. 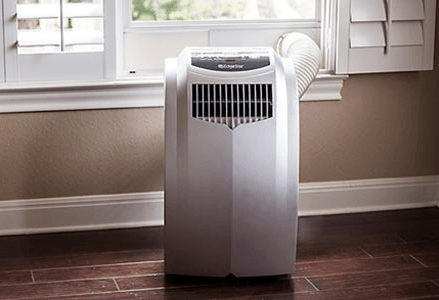 If the unit uses manual draining, for example, then you do not need to vent the AC exhaust air outside if all you need it for is to dehumidify a room or in fan-only mode. For most units, venting is also unnecessary when used in fan-only mode. But whenever air cooling is needed, a portable air conditioner must be vented outside somehow. Otherwise, the warm exhaust air will blow back into the room, defeating the purpose of having an AC. As always, check your manual to see what the manufacturer recommends. What size portable air conditioner do I need for my room? The capacity of portable air conditioners is measured in BTUs. You need about 20 BTUs for every square foot of space. So if the room measures 300 square foot, a 6,000-10,000 BTU air conditioner will do. Check the room size requirements of an AC before buying it. Manufacturers will often specify the maximum size of the room you can use it in. Do portable air conditioners need a water supply? No. Portable air conditioners don’t need water. They are not humidifiers. They produce water as they dehumidify the air in the room. 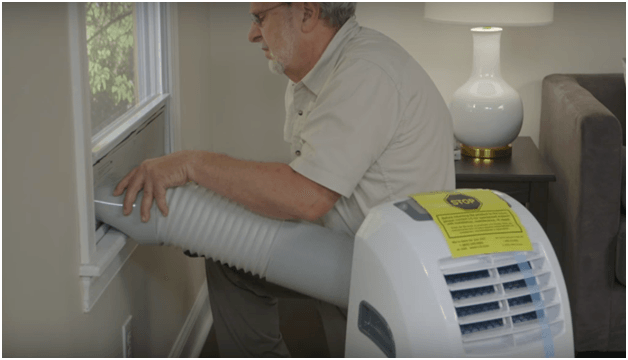 Can you vent a portable air conditioner through a dryer vent? In most cases, no. The manufacturer may even specifically warn against doing that. The reason is that a dryer vent and an air conditioner exhaust hose are usually not the same in size. There are other dangers in using a dryer vent, such as lint blowing back into the unit, which could cause a fire. If you need to use a dryer vent, then consult an HVAC technician before attempting the installation. How can I cool a room with no windows? You can vent through a sliding door, a drop ceiling or even through an exterior wall. See the tips above for more details.